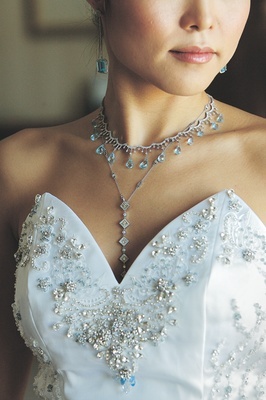 Shopping for the perfect wedding gown can be stressful: the seemingly endless days spent going from boutique to boutique, trying on so many beautiful dresses they all begin to blend into one. Now, imagine that experience multiplied by four, and you have Judy Oh’s bold fashion undertaking. 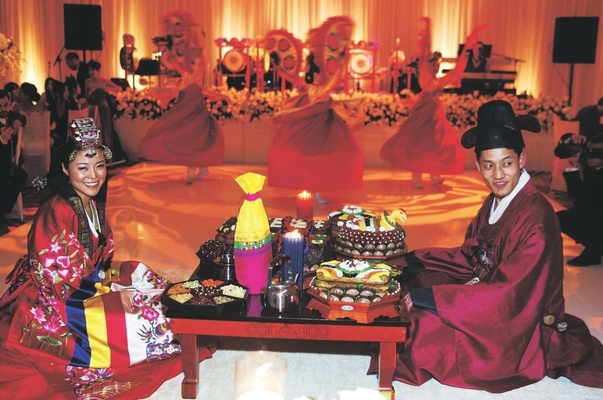 On her wedding day, Judy wore a strapless gown by St. Pucchi for the ceremony, a simple white dress for the first dance, a Monique Lhuillier dress for the reception, and a traditional ensemble for the Korean wedding ceremony called the paebaek, which she and groom Michael Moon also performed. With only two outfits to worry about – a tuxedo and the traditional Korean groom’s attire – some might say Michael got off too easy. Judy and Michael began their love affair after being introduced by a mutual friend. Their courtship eventually led them to the beach where Michael got down on one knee, serenaded her with the song “My Ideal,” and proposed to his blushing and ecstatic bride. 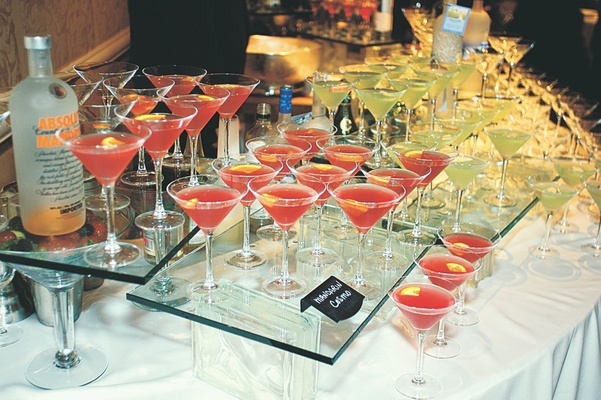 Realizing they needed assistance to plan their extravaganza, Judy and Michael enlisted the help of wedding planner Jonathan Reeves of Mindy Weiss Party Consultants. “He was the best and helped us from start to finish to make the wedding so much more wonderful than either of us could have possibly imagined,” asserts Judy. 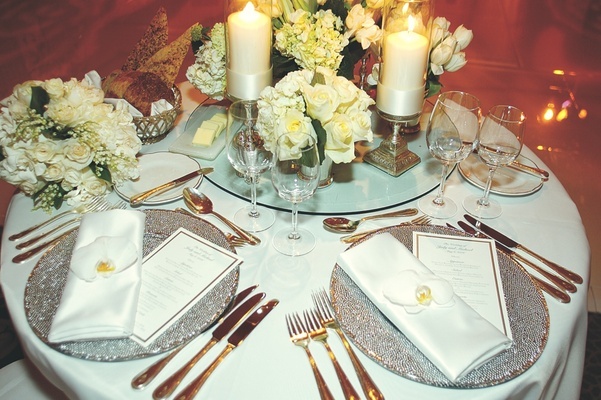 For their location, the bride and groom chose the Four Seasons Hotel Los Angeles at Beverly Hills, as its stunning outdoor garden and grand ballroom provided the ideal backdrop for the romantic and serene setting they envisioned. As Judy explains, to accomplish the look they “ended up using a lot of white, including the seat covers, wall fabric, flowers, and the dance floor.” As a result, guests encountered a white floral paradise upon arrival. 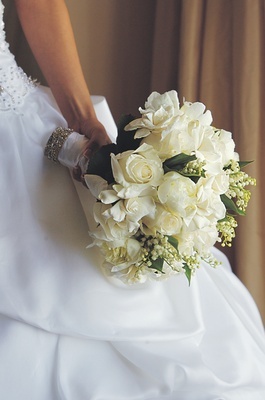 With two vocalists and a 10-piece ensemble accompanying her, the bride began her processional by passing under an archway elegantly wrapped with ivory, white, and light pink flowers, then walked down an aisle lined with rose petals and hurricane candles. 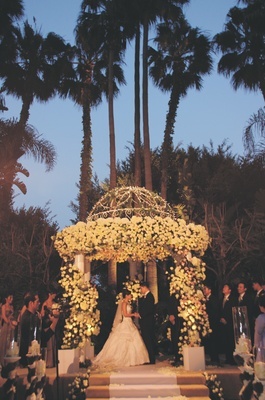 Arranged so that the couple would face the guests, the ceremony took place under a dome of twinkling lights, hanging candles, draped fabric, and flowers that mimicked the archway at the opposite end of the garden. But the enchanted décor did not disappear once guests entered the reception ballroom. A design of large and small roses projected from above lit the white dance floor, and the walls of the room were covered in sheer fabric, which combined with the all-white centerpieces and chairs to create an ethereal glow. 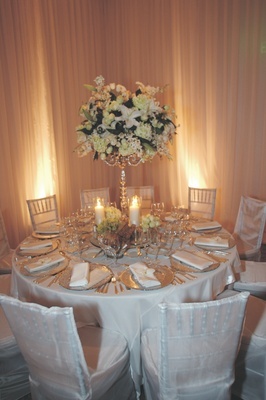 White phalaenopsis orchids were placed on each napkin, and three white taper candles completed each table. 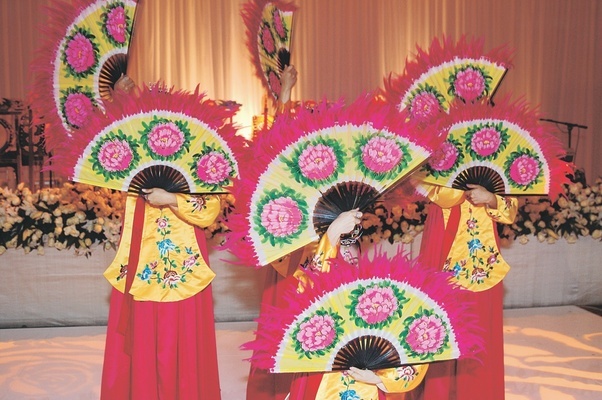 One of the highlights of the evening was the paebaek ceremony, which with its colorful palette of costumes and props, stood in stunning contrast against the allwhite ballroom. 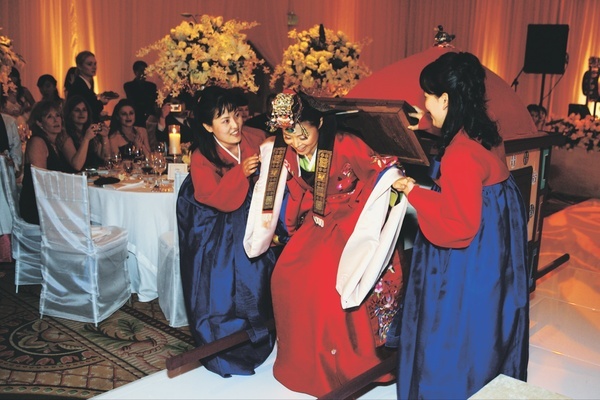 In a processional of friends and family, Judy was carried in like royalty on a throne-like gama, dressed in floral-embroidered red robe and beaded headpiece. 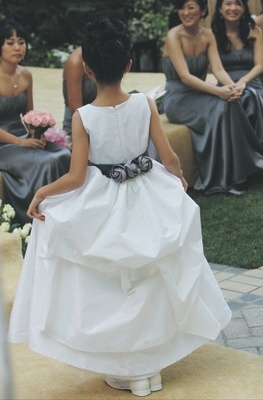 She and Michael then greeted each other with a bow signifying their promise of commitment and bowed to their families to show their respect. 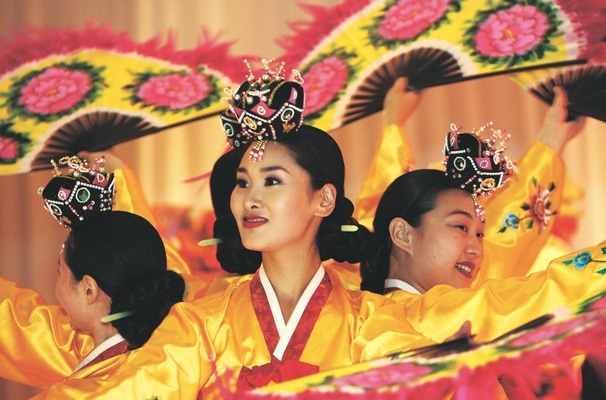 They participated in a ceremonial tea service and looked on as elaborately costumed women performed the traditional fan and drum dances to the amazement of everyone in the room.